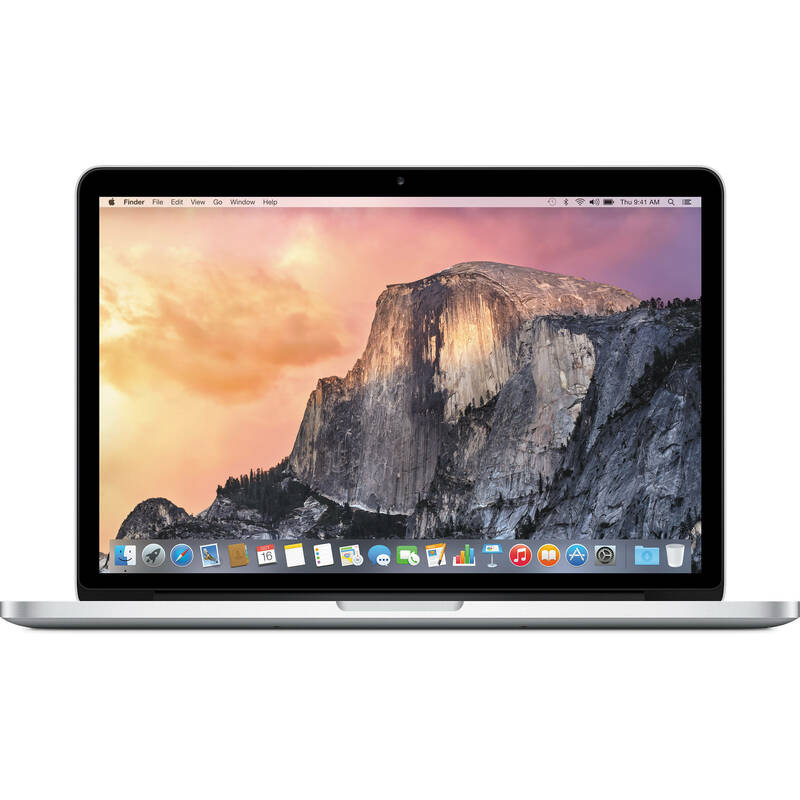 The 13.3" MacBook Pro Laptop Computer with Retina Display (Early 2015) from Apple is a powerful notebook computer with an innovative, ultrathin, ultraportable aluminum unibody design. It is loaded with advanced power management features and an integrated lithium polymer battery, which work together to provide up to 9 hours of wireless web browsing. The MacBook Pro with Retina Display also features the Force Touch trackpad. The Force Touch trackpad takes all the capabilities of Multi-Touch and adds force sensors that detect subtle differences in the amount of downward pressure you apply. This lets you have a deeper connection to your content, bringing more functionality right to your fingertip. It also introduces haptic feedback to MacBook Pro - allowing you not just to see what's happening on the screen, but to feel it. The system is powered by a dual-core 5th generation Broadwell 2.9 GHz Intel Core i5 processor. The 5th-gen Broadwell processor uses low voltage for improved battery life without sacrificing performance. The MacBook Pro with Retina Display also has 16GB of onboard 1866 MHz LPDDR3 RAM, 512GB of PCIe-based flash storage and an SDXC media card slot. You'll be able to connect to the Internet with high-speed 802.11ac Wi-Fi. The MacBook Pro also supports a/b/g/n Wi-Fi networks as well. The MacBook Pro also features built-in Bluetooth 4.0, which allows you to connect wireless headphones, keyboard, mice and other compatible peripherals without a hassle. The 5th-gen Broadwell Intel Core i5 processor with 14 nm architecture in this MacBook Pro provides fast dual-core performance. Intel Hyper-Threading technology allows two threads to run simultaneously on each core. The dual cores can run at a stock speed of 2.9 GHz. The processor can be overclocked up to 3.3 GHz, thanks to Intel Turbo Boost 2.0 technology. With a 4MB L3 cache and 16GB of onboard 1866 MHz LPDDR3 RAM memory, this MacBook Pro can run professional applications like Aperture and Final Cut Pro with ease. Box Dimensions (LxWxH) 16.4 x 12.6 x 4.2"
13.3" MacBook Pro Laptop Computer with Retina Display (Early 2015) is rated 4.9 out of 5 by 28. Rated 5 out of 5 by Michael from Sold and Reliable Workhorse I just upgraded to the 13.3 2015 MacBook Pro from a 2013 MacBook Air. The screen is incredible and the machine runs like a champ. Although the 2016 models have already been released, I personally love and wanted the legacy connection options (MagSafe Charger, SD card slot, USB 3, etc). I upgraded to a model with 16GB or RAM and a 512 GB hard drive. This machine is a genuine workhorse in a compact body with an awesome display. I've had the computer for about three weeks and only charged it a couple of time. The battery has lasted several days with a few hours of web surfing as time permits. Rated 5 out of 5 by Anonymous from Great Laptop! Bought this laptop mainly for work-related tasks and photo-editing. Awesome laptop and well worth the price thus far. My item arrived promptly without any issues. I like how B&H had the option to choose your specification (memory, cpu speed etc). I've did a ton of research and decided to go with the 2015 vs the newer models with the touch-bar because that feature wasn't useful to me. No regrets here ... so far, so good! Rated 5 out of 5 by Benjamin from Great product. I purchased this to replace an aging 2010 MBP.? The only things better about the 2010 are the keys (higher quality), and the cd/dvd drive on the old one.? Otherwise, this is a great unit.? I considered a newer one but I did not like the touch bar, can't stand the lack of ports, and the keyboard feels awful.? Overall if you want a great MBP that you can actually use (and it still has the mag safe charger), this is the one.? Good luck finding a brand new one.? Since I bought this from BH (a great seller by the way), they have since been removed from their website.? Plus compared to a comparably specified new one, I saved ~ $700 not including the savings from not needing to buy an adapters.? Thanks Apple from 2015 and thanks BH. Rated 5 out of 5 by james from Get it while you can Apple dropped the ball with the new MacBook pros. Limited ports requiring dongles and the new keyboards are sensitive to dirt requiring replacing a pricey fix. Upgrading from a 2012 MacBook Air this unit is a nice upgrade that should last me a good five years or more. The screen is a delight compared to the MBA screen. Rated 5 out of 5 by Anonymous from Smoth and wonderful laptop I was impressed with the speed and smothness of the laptop. Rated 5 out of 5 by Grant from Impressive Computer I'm still not sure it's worth paying 2x what it cost to buy a windows PC. However my last laptop came with Vista, which sucked. After I finally got used to it Microsoft basically forced you to upgrade to Windows 10 and my computer is getting painfully slow. I talked to several Mac owners who had older computers (one that's over 7 yrs old) and they all said their computers still run great. I figure if this thing last it will be worth it. I think the new MacBook designs are a mistake. Putting 4 ports on the 2016 machine that nothing fits is pretty dumb. The loss of the MagSafe charging connector if you have kids is a poor decision also. I would recommend anyone wanting a MacBook to buy one of these while they are still available to save some $ and have a computer with useable ports. Rated 5 out of 5 by dauble from Fully spec'd out, this laptop is awesome I fully spec'd out this laptop to suit my needs as a web application developer. I've had it a week now and have been impressed with it's speed and performance. The lack of a CD ROM drive is a bummer, however I was able to use Remote Disk from my old MacBook Pro and install some older software with ease. Rated 3 out of 5 by Anonymous from A Beautiful Display, But Many Issues The display of this computer is obviously its selling point and in that respect it meets or exceeds every expectation. I've spent some time in Photoshop and haven't noticed the issues some other reviewers have mentioned with Macs shipping with Yosemite or later. Everything works pretty effortlessly as is the norm with other Apple products. However, now for the CONS: -No Ethernet port (Apple wants you to use Thunderbolt for that and Thunderbolt accessories are EXPENSIVE) -Battery life is pretty underwhelming, it would take miraculous circumstances to get more than six hours -There is a hardware issue with the flash memory that Apple is using and they are being pretty tight-lipped about just what it is -- in short, the logic board has some incompatibility with the flash memory that makes data corruption a significant risk for long-term use (short-term use should be OK) -iFixit gives this model a repairability rating of 1/10 meaning Apple doesn't ever intend to fix it, but to smash it up and recycle it should there be ANY failure, a SHAMEFUL position for a company that claims to care about the environment If you can live with all of the CONS then it is worth a try. If buying this model, I'd recommend to get a backup hard disk. In addition to making frequent backups, you'll also want to keep an older backup around for awhile until you are SURE there is no corruption in your current backup. Otherwise, by the time you realize there is an issue, recovery may prove to be a significant and costly undertaking and in some cases it won't be possible. Is there any option to get also Hebrew on that keyboard? I am sorry, but Apple s not engraving Hebrew on the keyboards. But you can get a keyboard cover, I have attached. when will you have the 2015 MBP in stock? There is any option to get Hebrew with that keyboard too? Can I have a look at the pictures, which shows the current condition of the laptop ? Its brand new in original packaging. I chose it because it has all the ports. I have been very pleased with it. Is this the new retina macbook pro (Early 2015 model) with force touch? I need to put a security lock, but the macbook does not bring a kensington ranch. I do not see it in the recommended accessories either, Can you tell me which product I should add.Thank you? I use the Maclocks Ledge Lock Slot Adapter with Combination Cable Lock , sold by B&amp;H, on both a MacBook Pro and MacBook Air. Sticks out a little, but otherwise works great. I tried but didn't like other add-on locks with larger brackets. Was this product discontinued by Apple or did this site sell out of it and will get more at a later date? This is not a discontinued product as far as i know.